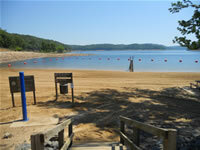 See the Dequeen Lake website for additional information. Primary recreational opportunities are listed below. Directions: From DeQueen, 8 miles north on US 71. 5 miles west to the lake. Factoid: The U.S. Army Corps of Engineers welcomes you to DeQueen Lake and wishes you an enjoyable stay at the project. The project offers the visitor extensive opportunities for a memorable outdoor recreation experience. Food, bait, tackle, etc. are available near the lake. Project personnel are available and will be happy to assist in assuring you a pleasant stay.